We’re among the group of parents that choose to let out kids believe in the sort of magic and childhood whimsy that comes along with believing in Santa Claus, the Tooth Fairy, and the Easter Bunny. Despite my oldest being bombarded by classmates since Kindergarten (yes KINDERGARTEN!!) that these things aren’t real – we have two believers in our home. What about your family? Have you thought about the best way to tell your kids the truth about Santa and more? Luckily, there’s a brilliant tool out there to help navigate this changing childhood terrain in a helpful and empowering way that celebrates this coming of age. 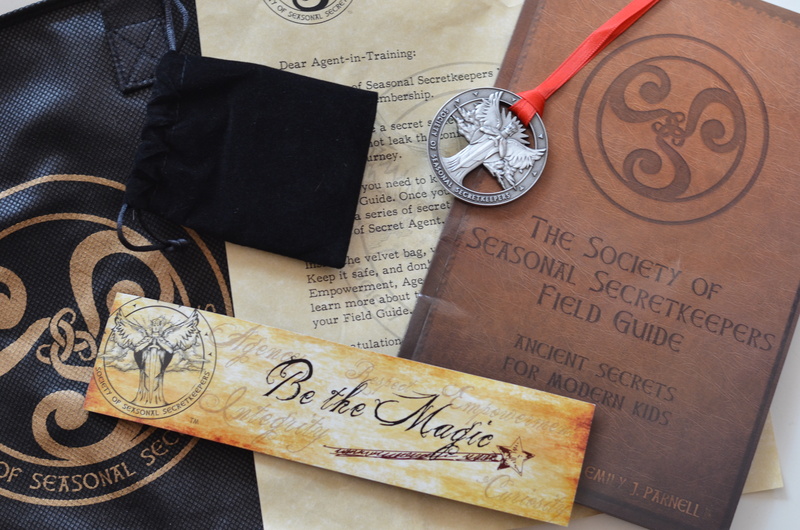 Enter the Society Of Seasonal Secret Keepers, a gift set created by a mother of two to help guide kids while enlisting them as Society Secret Keepers. A personalized welcome letter from the Society of Seasonal Secret Keepers inducting your new agent into an exciting new stage of growth. A heirloom token, inside a velvet bag, inscribed with the Society’s seal and their core values of Empowerment, Agency, Respect, Curiosity, and Integrity. An 80-page book entitled The Society Of Seasonal Secret Keepers Field Guide: Ancient Secrets for Modern Kids. Access to an online Society Mission Control portal to provide seasonal missions and ideas, which keep the field guide fresh and current all year-round. We have no idea how smoothly this new stage will begin in our family when the time comes – but this is the best resource we’ve found. We love how the induction into a secret society can make a kid feel cool and empowered with their own specific training manual to help them navigate this new phase. We think it’s AMAZING that significance is placed on vowing to protect and honor traditions (agents are bound by an oath) while caring magic on for others who believe. And we think that truths are presented in the best way possible with an emphasis on magic as symbols of love and giving, and a sense of earned responsibility with growing up. This is so interesting (and something I would have loved as a child!). I’m torn as to whether or not I want my kids to know the reality of Christmas or know only the ‘whimsical’ part of it. I’ve been trying to find a happy medium…they know about Santa but we don’t talk about him a lot. I try to focuse more on what the season is about (i.e., helping others, etc. ).